Coffee is a funny thing. The more I drink it the better I feel, the better I feel the more I want to drink it. So I guess its a self sustaining prophecy of sorts. However prognosticator of prognosticators it isn’t know for being. Unless you had a greek grandmother reading your future in the coffee grounds (More on that another time) Coffee has never really been put forth as a sooth sayer, or a sayer of anything, soooth or otherwise. How about the weather? Yup you read that correctly. 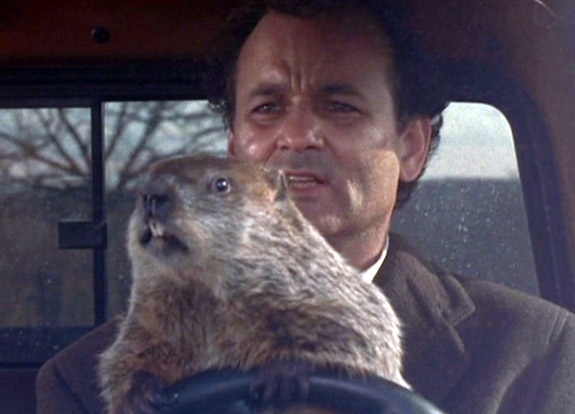 Your coffee, or tea if you are so inclined, can actually predict the weather with a fair amount of accuracy. You see pressure is a funny thing. And atmospheric pressure is all around us. And actually deforms the surface of our beverages. 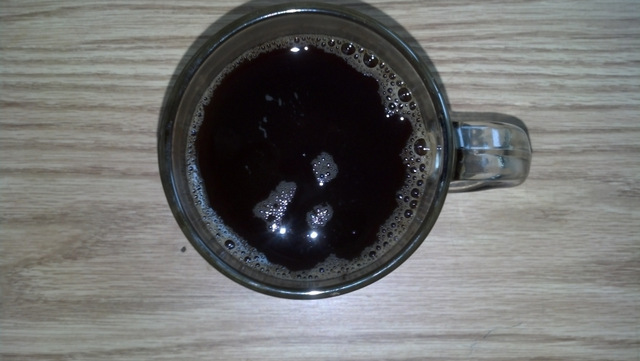 The surface tension of coffee (tea, water ect) holds or grips the sides of a mug when placed in it. And when you pour your coffee you can get bubbles. Here is a trick. 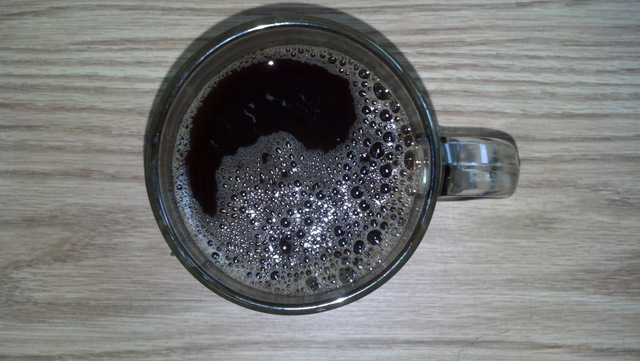 The higher the pressure is the more concave the surface of the coffee is in the mug, more pressure is a good thing. Higher pressure means nicer days. The lower the pressure is the flatter, or even more convex the surface of the beverage becomes. 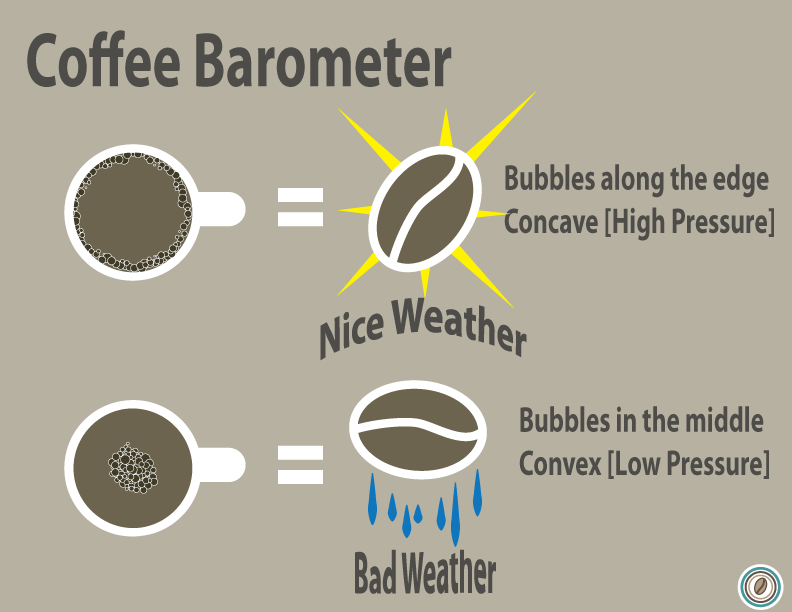 Depending on where your bubbles are the barometer in your mug is telling you what type of day you will be having. Bubbles always go to the highest point on the surface, so if the center is higher then the bubbles go there, same goes for the edge. All well and good but what about other less common weather patterns? I have your cheat sheet right here. See the more you know! Who knew coffee could tell us sooo much. by the by if your bubbles look like this you are probably mediating. I think it looks like a Yin Yang… but that could just be the coffee talking. Not withstanding the efficacy of this method there is another way .. a long time ago I noticed that sometimes my coffee cup would get very hot, whereas at other times it got warm but not hot. I had postulated it was caused by barometric pressure and supposed that when the air pressure was high the cup got hot because of the fraction more heat required to bring the water to the boil .. it was the other way around low pressure caused the cup to get hot!